Airdyne Aerospace Inc. | U.S. Government Provides New SABIR System to Enhance Philippine Air Force Capabilities - Airdyne Aerospace Inc.
Manila, August 14, 2018 — U.S. Ambassador to the Philippines Sung Y. Kim turned over a sophisticated surveillance and reconnaissance system worth PhP807 million to the Secretary of National Defense Delfin N. Lorenzana at Villamor Air Base, Pasay City, on August 14. The Special Airborne Mission Installation and Response (SABIR) system will increase the Philippine military’s maritime domain awareness, airborne command and control, counterterrorism, and humanitarian assistance and disaster relief (HADR) capabilities. “The transfer of the SABIR system today, along with the Scan Eagle system this past March, and the C-208 aircraft in August 2017, represents our steadfast commitment to enhancing the capabilities of the Armed Forces of the Philippines,” said Ambassador Kim at the ceremony. 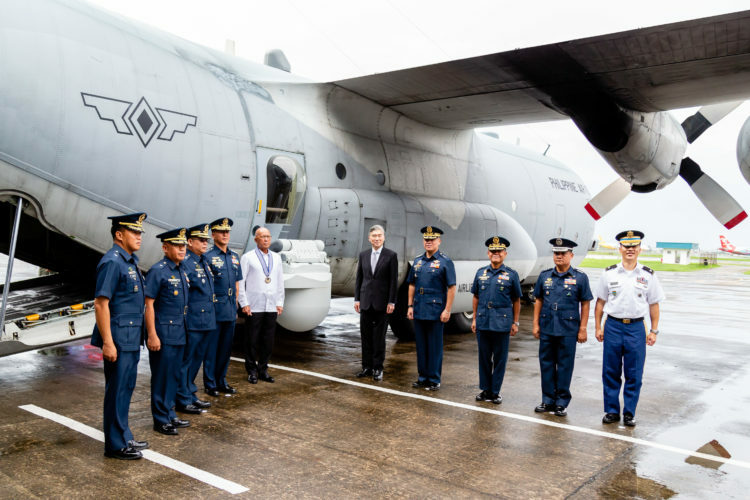 Ambassador Kim and officials from the Joint U.S. Military Assistance Group provided the system to the Philippine Air Force (PAF) through Maritime Security Initiative (MSI) funding, a U.S. initiative to build the maritime capacity of Southeast Asian nations. The total value of the transfer is PhP807 million ($15.1 million), which includes the cost of training, installation, and sustainment support in addition to the equipment itself. The SABIR system is a bolt-on avionics module for the C-130 Hercules aircraft. The system upgrades the aircraft with advanced command and control, communications, computer, and surveillance and reconnaissance capabilities without sacrificing the aircraft’s primary function as a cargo plane. This SABIR system will be operated by the PAF’s 300 Air Intelligence and Security Wing (300 AISW) out of Benito Ebuen Air Base, Mactan. The 300 AISW provides the PAF with near-real time intelligence, surveillance and reconnaissance capabilities through both manned and unmanned aircraft, including the SABIR system, Scan Eagle Unmanned Aerial System, and the C-208 aircraft, all donated by the United States government over the past year. The 300 AISW was upgraded from a Group to a Wing in February 2018 to support the growing requirements of new platforms and equipment arriving from U.S. grant-funded programs like the MSI. The United States, as a longstanding friend, partner, and ally of the Philippines, continues to provide support to the Armed Forces of the Philippines (AFP) through both grant assistance and expedited sales of arms and munitions to assist both long-term AFP modernization goals and urgent counterterrorism and HADR requirements.